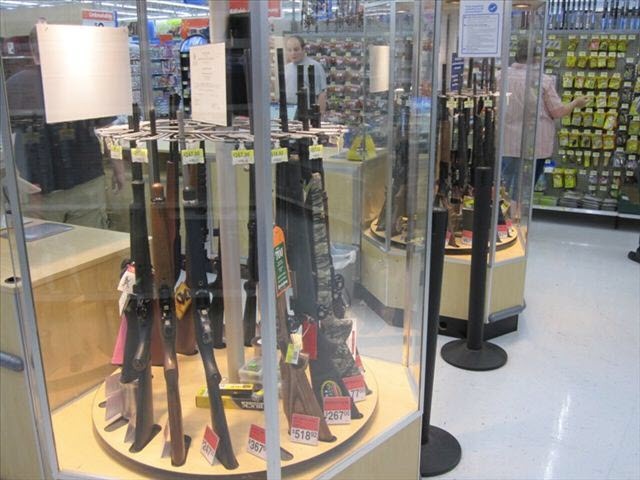 Today, while visiting Wal-Mart, I took a photo while at the gun sales counter. 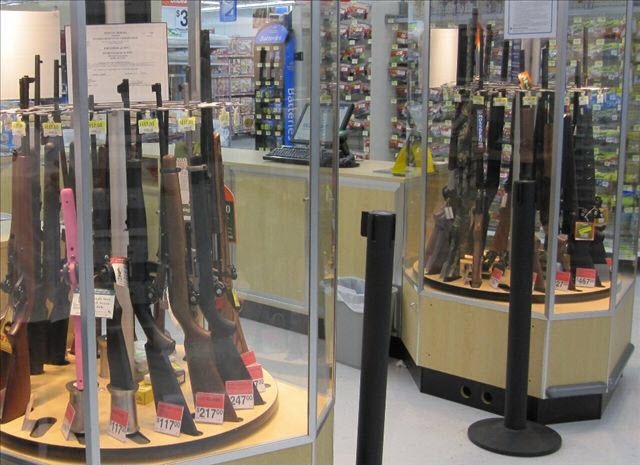 The guns were sold in a rotating glass display case just like this with price tags attached. If interested, you just ask the salesperson to take it out for you to examine. Being able to buy a gun while buying groceries at Wal-Mart, convenient. In this glass display case are different types of ammunition. I’d like to ask the lou zhu a question. It may be very naive but please be so kind as to give me an answer. Since guns are sold like this in America, is their government not afraid of social problems? Right now in Shanghai, the supermarkets selling cooking knives have also locked them inside glass display cases like this. Because the hostility between their people is not as deep as it is with us, which is to say they are harmonious in the true meaning and not river crab. Hehe. China bans guns and aside from political reasons, it may be because the government has considered that there are too many neurotic people in China, people who will bark/howl for no reason. If these kind of people had guns, imagine how bad it would be. (I’m referring to the issue, not people, so I hope certain people will keep that in mind before responding). I think the American Constitution has a part that says the citizens have the right to overthrow an authoritarian government…it is what I have heard, not sure if it is true or not. But in China, that is not possible, and the key is that the character of the people [on average] is not there yet. If firearms were available for sale in China, then we’d probably have to wear bullet-proof vests in order to go out. Our country’s people have treachery/trouble-making in their bones. You can see it now, in all of China, no one respects anyone else. Learned men scorn each other and military men are lowly to each other, this place cursing that place. If everyone in China had guns, then the country would be torn apart. Even though everyone speaks Chinese, everyone has a different heart. Are we lacking lessons from history?!! Only with citizens who have high restraint and a society with relatively few injustices would [a country] dare be like this. Imagine for a moment, if we were to sell guns in this manner, I think those domestic tigers, birds, bears, these animals basically could no longer survive. I think I saw a short-barrel M700, did I see wrong?? America is really not bad. The weapons that are sold without restrictions appear to be those used for hunting, but even openly selling firearms like this truly makes people sigh. If this were China, the number of crime-related deaths would increase ten times. Therefore, America’s gun deaths is still very little. In the future [if guns were allowed in China], those who are involved in forced demolitions and chengguan would not be so niubi anymore. Pressure us and they’ll just shoot you a few times. Damn, foreign countries are too incredible, even allowing guns to be sold. If China were to also allow them to be sold, things would be a mess. [The population of] black society [organized crime] would at least increase 2 times. And with China’s current education level, it is possible that school shootings would happen often. America is a country that was built up from the first shot of the Battle of Lexington. And the biggest reason they were victorious at the time was because the ordinary people had guns. When everyone has guns, no one is afraid of a few people having guns. If it is fear of overthrowing the government, there is no need. If the current government in power truly doesn’t follow the people’s will, in four years at most, they will have to step down and at worst there are still impeachment procedures. There is no need to use knives and guns [no need for violence], truly not worth it. If one wants to express one’s political views, one can organize one’s own political party. Although America in reality is only a two-party system, there still exist other political parties, and what more, the constitution protects the participation of every political party, with the most powerful non-mainstream parties like the Green Party normally getting around 10% of the vote. If one day, this party were to replace the Democratic Party or the Republican Party, the constitution would also protect it. And when there is social disorder, there is the SWAT. With so many people having guns in America, I don’t think a little handgun or a small hunting rifle can cause any social impact. Over time, Americans have developed the habit of not using guns even if they have them. Or maybe they are bound by ideas of individual heroism, believing that men should use fists to fight it out, and not relying on guns. But in our country, the once proper so quick to resort to taking up knives, if there were guns, definitely within 10 years, the population of Chinese people would probably be reduced by half…haha. Previous article Online “Imperial Harem” Games Promote Slavery & Narcissism?